FaceTime – 3G Video-Calls aren’t new. Forget about the slow 3G video calls cos’ Apple’s new FaceTime provides a simpler and more user-friendly interface than Skype and other jerky video-conferencing handsets. Gone are the days when you need a PC (and many steps) to connect with the world. Video-call with your loved ones is just one button away – as easy as making a normal phone call! Thanks to the new iPhone 4 and high-speed WIFI – it is super-handy and mobile! You can walk around and chat! Plus the video quality & connection is smooth! Often, I have to sms my sister to get her standby online (via Skype) for our weekly video-calls. If she is not around at home, I have to wait till she is back before I can chat online with my old folks. 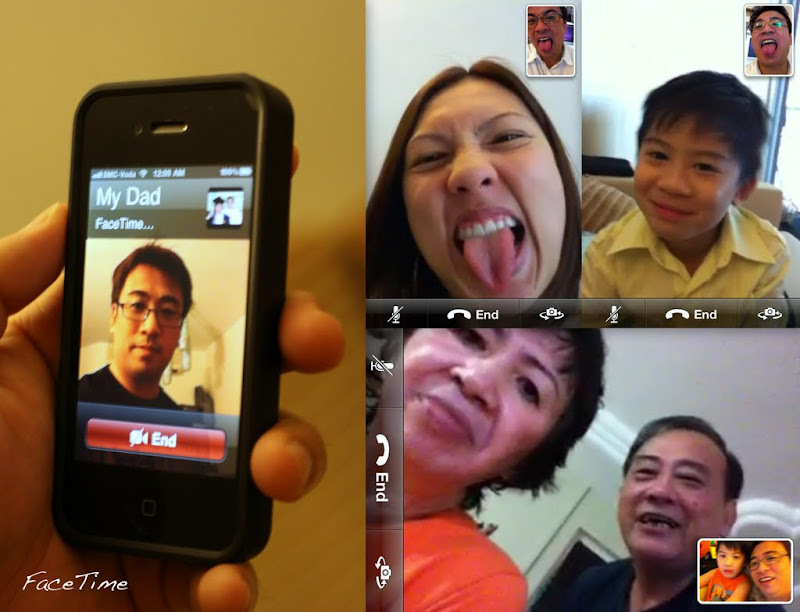 With FaceTime, I just need to dial my dad’s number and we can see and hear each other on our own screen. It is so convenient and free!